2. Eligibility. Subject to the additional restrictions below, the "ABC10 2018 Smokey Robinson Sweepstakes" (the "Sweepstakes") is open to legal residents of the State of California who are 18 years or older at the time of entry. Employees and contractors of KXTV ("Sponsor") TEGNA Inc., Black Oak Casino, and each of their respective affiliated companies, and advertising and promotional agencies, and the immediate family members of, and any persons domiciled with, any such employees or contractors, are not eligible to enter or to win. 3. How to Enter. The Sweepstakes will begin at 10 a.m. (P.T.) Saturday, August 4, 2018 and end at 1:00 p.m. (P.T.) Friday, August 10, 2018 (the "Sweepstakes Period"). Enter by visiting Sponsor's Facebook page at website (http://www.facebook.com/abc10tv), completing all of the required information (name, address, and email address), and following all posted instructions. Complete the entry form and any other required fields and then submit your entry by clicking on the "SUBMIT" button. Entries limited to only one (1) entry per person. Your computer must accept cookies, or any successor or similar technology, which may be used for the purpose of entry tracking. Ad blocking software on your computer needs to be disabled so it doesn't interfere with processing your entry. After 1:00 p.m. (P.T.) Friday, August 10, 2018 two (2) Winners will be selected from all eligible entries. Prizes limited to one prize per household. 5. Prizes and Odds. Prize. 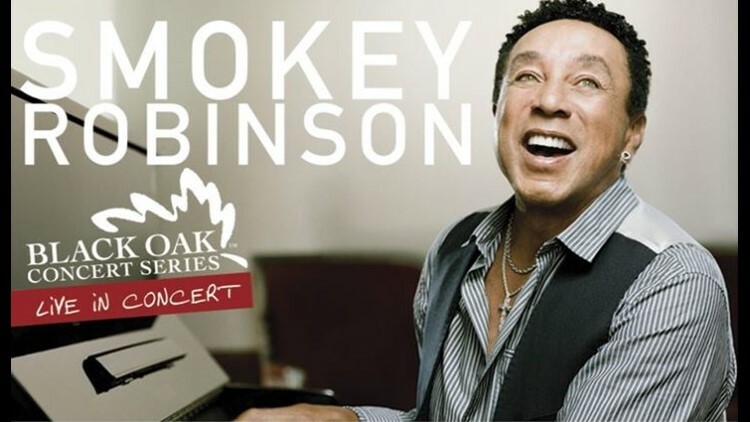 The Winners will receive two (2) tickets for the Smokey Robinson performance at 7:00 p.m. (P.T.) Saturday, August 18, 2018 at Black Oak Casino / Westside Pavilion, 19400 Tuolumne Road North, Tuolumne, CA 95379. (ARV Prize Package: $180). 6. Winner Notification and Acceptance. Winners will be notified shortly following each prize drawing via the e-mail address provided on winner's entry form. Winner must respond to such e-mail notification within 48 hours after notification. Failure to respond within such time period or return of email prize notification as undeliverable may result in disqualification and an alternate winner may be selected from among all remaining eligible entries. To claim the prizes, each Winner must personally visit Sponsor's office at 400 Broadway within four (4) business days after notification (office visits must be between the hours of 8:30 a.m. (P.T.) and 12 Noon (P.T.) and between 1:00 p.m. (P.T.) and 5:00 p.m. (P.T.) weekdays). A valid photo identification may be required. Winners may waive his/her right to receive prizes. All prizes are nonassignable and nontransferable. Prizes are not redeemable for cash. No substitutions allowed by winners. Prizes, grand prize and individual components of prize packages are subject to availability and Sponsor reserves the right to substitute prizes or grand prize of equal or greater value. Winners are solely responsible for reporting and payment of any taxes on prizes. Winners may be required to complete an affidavit of eligibility/liability and publicity release which must be returned as instructed by Sponsor. Failure to sign the affidavit or release, or to comply with any term or condition of these Official Rules, may result in a winner's disqualification, the forfeiture of his or her interest in the prize or grand prize, and the award of the prize to a substitute winner. Except where prohibited, acceptance of any prize constitutes winners' consent to the publication of his or her name, biographical information and likeness in any media for any commercial or promotional purpose, without limitation the Internet, or further compensation. Prizes or grand prize not won and claimed by eligible winners in accordance with these Official Rules will not be awarded and will remain the property of Sponsor. 7. Participation. By participating, entrants agree to be bound by these Official Rules and the decisions of Sponsor. Sponsor reserves the right to disqualify persons found tampering with or otherwise abusing any aspect of this Sweepstakes as solely determined by Sponsor. In the event the Sweepstakes is compromised by a virus, non-authorized human intervention, tampering or other causes beyond the reasonable control of Sponsor which corrupts or impairs the administration, security, fairness or proper operation of the Sweepstakes, Sponsor reserves the right in its sole discretion to suspend, modify or terminate the Sweepstakes. Should the Sweepstakes be terminated prior to the stated expiration date, Sponsor reserves the right to award prizes based on the entries received before the termination date. Sponsors will not be responsible for incomplete, lost, late, misdirected or illegible entries, or for failure to receive entries or other electronic communications due to transmission failures or technical failures of any kind, including, without limitation, malfunctioning of any network, hardware or software, whether originating with sender or Sponsor. In the event of a dispute, all online entries will be deemed to have been submitted by the owner of the ISP account from which they were sent. For these purposes, an ISP account holder shall mean the natural person assigned to such ISP account by the Internet access provider, online service provider or other organization responsible for assigning ISP addresses for the domain associated with such ISP account. Any questions regarding the number of entries submitted by the owner of an ISP account shall be determined by Sponsor in its sole discretion. By participating in this Sweepstakes, each entrant agrees to fully release, forever discharge and hold harmless Sponsor, TEGNA Inc. and Facebook from and against all claims, costs, liabilities, losses, injuries, and damages arising out of the Sweepstakes, including, but not limited to, any claims for personal injury, death or damage to or loss of property or any other harm arising out of entrant's participation in the Sweepstakes, the receipt, use, or misuse of any prize, or any travel or activity that is related to the Sweepstakes or any prize. This Sweepstakes is in no way sponsored, endorsed or administered by, or associated with Facebook. Sponsor is not responsible for operation of Black Oak Casino or Westside Pavilion, including cancellations, closings or schedule changes. 9. Sponsor. The "ABC10 2018 Smokey Robinson Sweepstakes" is sponsored by KXTV. The decisions of Sponsor regarding the selection of winners and all other aspects of the Sweepstakes shall be final and binding in all respects. Sponsor will not be responsible for typographical, printing or other inadvertent errors in these Official Rules or in other materials relating to the Sweepstakes. For a list of winners (available after August 15, 2018) or a copy of these Official Rules send a self-addressed, stamped envelope to "Winners List/Official Rules" (as applicable), "ABC10 2018 Smokey Robinson Sweepstakes," 400 Broadway, Sacramento, CA 95818. If you have any questions regarding this Sweepstakes, please contact Corinne Stubbs, cstubbs@abc10.com, (916) 321-3333.